After the Joplin day, there were a lot of differing emotions from members of the group as we awoke at the hotel. It was one of the more interesting breakfasts I’ve had on tour as everyone had a slightly different perspective. But, regardless, it was day 7 and time to get back on the chase. We stayed in Tulsa that night (first time I've ever been to that neck of Oklahoma). Today's target was the triple point formed by the dry line advancing into Western Oklahoma and the outflow boundary draped over the northern part of the state, so we headed to Enid for our first stop. Since it was a short drive, we had a lot of time to wait before the storms got going, so we had time for lunch (an aside, A&W just ain't what it used to be) and then parked at a mall and let people walk around. After about an hour the dryline was clearly ready to light up and we headed west out of town, stopping near Lahoma to observe. There were 3 cells building to our west and clearly they had some spin to them as they produced 2 or 3 shear funnels right away. We debated for a moment about heading after the northern or southernmost of the cells and decided on the southern cell, heading south and stopping just to the east of Homestead to observe. The storm was VERY electrified and CG's were popping all around. But, our cell didn't look all that good and we were thinking about heading north when suddenly the storm produced a stout funnel directly west of us, so we charged down a dirt road towards it and soon it produced a very nice rope tornado that was on the ground for a couple of minutes. After that the storm cycled and we headed east to stay with it, but it collapsed on itself. Then, after some indecision, we chose to blow off the northern storms that were looking like a multi-cell mess and head south for a monster supercell far to the south near Anadarko. As we turned south out of Hennessey and blasted through Kingfisher, a small LP supercell in between our storm and us really got going, and as our storm to the south was turning so hard that we decided we'd never get to it, we targeted that storm which now had a nice couplet on it and a huge inflow band. We charged west towards Calumet and got there just as the storm developed a large twisting wall cloud. The storm had several massive in-flow surges of 70 MPH or more, giving us all a serious dirt bath and looking like it was ready to tornado but it could never get it done and shortly thereafter the updraft totally collapsed. We headed south to see if we could get on the southern most storm, getting as far as El Reno, but that storm was dying, then we headed back north to a big shelf cloud and could see that everything to the north was completely undercut, so we decided to call it a night and head for the hotel, which is the host hotel in Oklahoma City, in time to relax and have a real dinner. We did have an interesting moment as getting back to the hotel room after dinner I checked radar only to find a severe storm with a big hook, strong shear marker, and TVS (tornado vortex signature) turning right hard such that the hook was going to pass right over us! The storm had great cloud to cloud lightning so I set up the tripod and watched. Even in the dark you could see two big inflow bands streaming into the storm and warm inflow was heading into the storm at my back. A little later, the outflow came and things got windy and cold, and looking at the radar it was clear that the storm had fallen apart, blowing out a big outflow boundary in the process. So, the moderate risk for today didn't really verify as the shortwave coming through was not in sync with the advance of the dryline, but at least we got the only tornado anyone saw in Western OK and it was a fun chase day. The mileage for the day was only 345, another fairly short day. 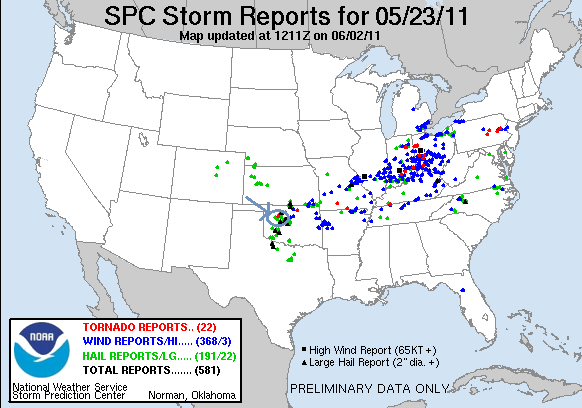 It took a bit of time to rally from the Joplin incident o the previous day, but by the middle of the day the following day we were back into chase mode. Leaving Tulsa, we headed to Enid, OK, stopping for lunch, and then proceeded west to Lahoma. Strong mid-level rotation was immediately evident, as shown by the big shear funnel in the left part of this still. We proceeded south and stopped on Route 8 east of Homestead. A precip core opens to the northeast of the updraft (to the left), while inflow streams into the storm (right front). This storm again was highly electrified, meaning it was hairy getting out of the vans to shoot pictures. We were about ready to abandon this storm when suddenly a large ropey funnel formed and started descending towards the ground! We charged west towards it. And just like that, tornado! Note the small debris field just left of the tree in the left-center of the shot. Debris field becomes much more defined. What a cool tornado! It only lasted 3 or 4 minutes and we were about the only chasers on it. It also turned out to be the only tornado of the day anywhere in Central Oklahoma! We stayed with the Homestead storm for a while longer, but it weakened and we headed south, planning on intercepting a storm near Chickasha. On the way however, a storm took off near Calumet and became tornado warned, so we targeted it. Here the Sun peaks out around the rock solid updraft as we approach from the east. We drove right up to the updraft base, but the storm had only a small wall cloud. The much more defined wall cloud now showed violent rotation. Additionally, the inflow into this storm was incredible! Cameras and tripods were in constant danger of getting blown over by the inflow coming in from directly behind us. The wall cloud cycled 2-3 times while we watched, each time it intensified marked by a massive inflow surge. Here, some of the guests getting an inflow dirt bath! Later that night at the hotel in OKC, I got back from dinner and noted lightning to the northwest, so I went to my room and looked at the radar to find a big supercell with a massive hook echo was heading almost directly towards us! I set up the tripod just outside the hotel lobby and took some lightning shots, which illuminated the classic supercell structure! BOOM! This storm had a rock solid vertical updraft and two big inflow bands streaming into it. Luckily it weakened quickly as it approached the city, missing out location and passing by just to our north in Piedmont. Like El Reno, Piedmont would see a large tornado the following day as well!